Former Police Officer Jason Van Dyke was found guilty of second-degree murder after dashcam video called into question the police report on the shooting of 17-year-old Laquan McDonald. Former police officer Jason Van Dyke was beaten at the prison where he's serving six years for killing a black teenager, his wife told a Chicago newspaper. "We are all petrified and in fear for Jason's life," Tiffany Van Dyke, told the Chicago Sun-Times. "Jason just wants to serve his sentence. He does not want any trouble. I hope prison officials will take steps to rectify this right away. He never should have been in the general population." Van Dyke's attorney confirmed "an incident" involving her client but would not characterize it. "I've learned there was an incident where Jason was housed," Jennifer Blagg told CNN Wednesday night. "We have expressed our concerns to the Illinois Department of Corrections and hope that they will act as expeditiously as possible to ensure he is safe." For safety reasons, Blagg declined to say where Van Dyke is being held. Van Dyke was convicted in October of second-degree murder and 16 counts of aggravated battery with a firearm for killing 17-year-old Laquan McDonald in 2014. Van Dyke fired 16 shots in about 15 seconds. He was sentenced to six years and nine months in prison on the murder charge. Word of the incident comes days after Illinois prosecutors said they are challenging Van Dyke's sentence. The special prosecutor who tried the case and the state's attorney general filed a petition with the Illinois Supreme Court, asking the court to vacate his second-degree murder sentence, authorities said. The petition asked to instead impose a sentence on each of the 16 counts of aggravated battery with a firearm. The aggravated battery charges carried potentially more prison time. Each of the 16 counts would have carried a minimum sentence of six years in prison. When combined, he could have faced up to 96 years in prison, a stiff penalty many protesters and activists were hoping for. Van Dyke had argued he fired in self-defense after he said McDonald lunged at him with a knife. 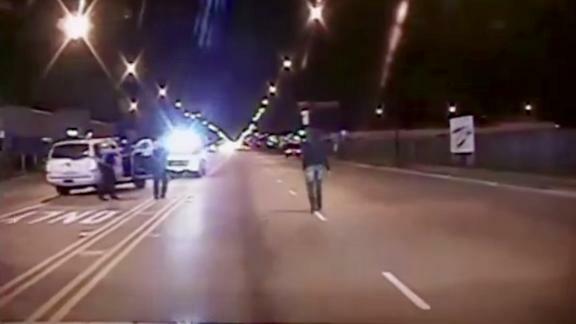 But a Chicago police dashcam video showed McDonald walking away from police, rather than charging at them. The release of the video led to protests and a national conversation about police use of deadly force. Van Dyke has been in custody since his conviction in October.